I'm not trying to judge or anything...but sometimes you have to know your limits and taking out a loan for 20K at the casino (after you already lost your stash) and then losing it and saying yes to being a drug mule in Vietnam to repay that debt (if that's truly what happened...) - well - I'd say that's past my limit...and most other people's as well. 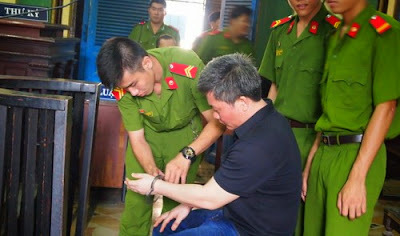 The People’s Supreme Court on Friday ordered cancellation of the capital punishment for Dinh Jason, a 42-year-old Vietnamese American, who appealed the sentence given to him by the Ho Chi Minh City People’s Court on April 22, 2014, according to VnExpress. Dinh was charged with “illegally transporting drugs” pursuant to Article 194 of the Penal Code. After reviewing the case file, the Supreme Court requested the investigation agency to re-probe it and determine the exact volume of heroin carried by Dinh as an important basis for conviction.